You had a hectic week, but still so full of love and humor. Your mention of Princess Diana and her motto took my breath away. I cried for an entire year after her death. She was so precious.. and of course, we’ll only every think of her as young and beautiful like Marilyn Monroe ! I am very fond of wholemeal bread. It makes for good eating and a good life overall. When I look at your photos and read your words, I think you do Kubla Khan rather well too. I think the birds in your garden would agree for they feast on the equivalent of honeydew and the milk of paradise. As for the teeth and the garage door and the scrunched car; that’s like finding those gritty stones in your wholemeal bread. Happens rarely but very unpleasant all the same. Now I will raise a cup of tea and give a toast to LIVING. Wholemeal bread yes – honeydew yes – the whole nine yards !!! I’ll make a cup of tea myself and join your toast to Living !!! Lovely heartfelt post, Valarie. As we Americans say ..making lemonade out of lemons. You indeed accomplished much that day. I love the early morning romp with the goats in your slippers and pajamas. This is the best of memories…the teeth and car issues are inconveniences and will clear up. Love your wisdom and wholemeal bread. Thank you Lynne, good to hear from you… so glad you enjoyed my ruminations ! I love that phrase making lemonade out of lemons – yes ! Well, I’d call it a very eventful day! – delighted by persimmons, butted by goats, farewelling friends, and then over the next days dealing with accidents but still able to feed the wood pigeons, read blogs and write it all up, with reflections on Montaigne; it’s all so rich. I hope your teeth will settle and your finances recover. Oh Juliet, lovely to hear from you, and what a delicious comment !Glad you enjoyed Montaigne ! Staggering on with the teeth – three injections yesterday which still didn’t numb the pain… feel as tough my jaw has been punched today !!!! This a a very roundabout way of contacting you, but it’s the only way I can find! Can’t wait to see you to see how to work out how to get onto your blog. Do you have a spare day in the next two or three weeks when we could meet? Dentist again tomorrow, and then I’m free most days except Thursday Tai Chi. Hope you find this ! Love valerie.. LOVED the goat story! And wishing I had goats too…. Goats are gorgeous aren’t they? so intelligent and sensitive…. I’ve not had the pleasure of making the acquaintance of many goats but I like your description of them as intelligent. Already I want one for my garden. They will eat everything in your garden ! They love a mixed diet, grass bores them ! and they can jump a high fence, and get out of any hole – so beware !!!! I’d love one, but they need plenty of space, they are so fleet footed and active ! Think wide open Alps or the Himalayas !!!!! So maybe I’ll wait til I get that farm I’ve been dreaming of before I get a goat! hope your dreams come true, and you enjoy a happy goat or two !!!! This was so good to read – at this dreadful hour after having spent the last hour and a half coughing – er I mean living. 😉 Thank you. Valerie … many thank you’s (late I fear). Today I think that I turned the corner. Yeah! Hello Michele, yes, life never seems to stop does it ! ( I suppose it will, one day..). in the meantime I have a list of things I want to do when I have time !!!! Love the way you find the beauty and treasures even in less-than-perfect times. Hope you are feeling 100% again soon! Thank you friend, lovely to hear from you…and so glad you enjoyed my self-indulgent ramblings! Hope all is well with you these days…. 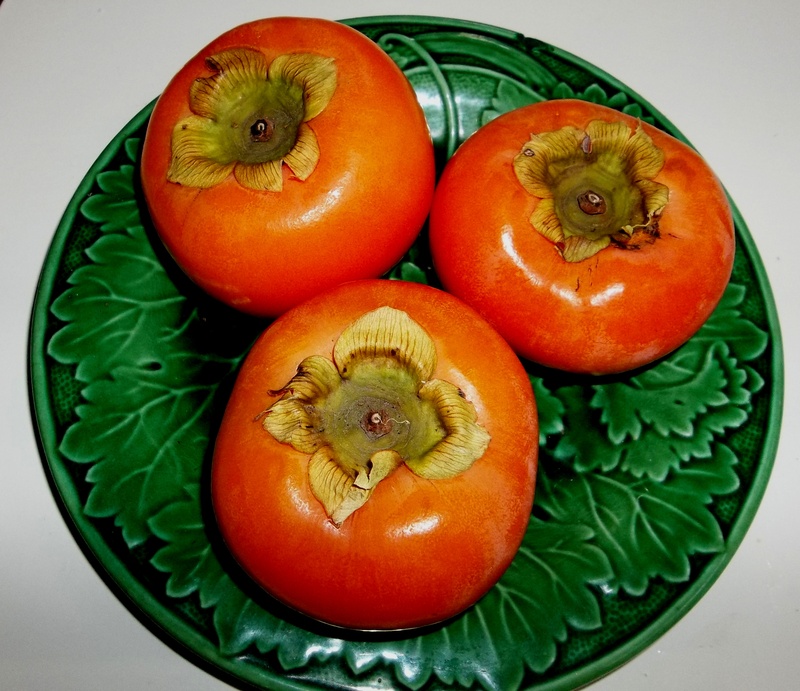 Hello Amy, thank you – as you can see I can’t resist persimmons – even the name enchants me ! Thank you for your good wishes… things are a bit worse than they were, but they have to get better with doses of disprin and salt water rinses!! That is unbearable… I feel your pain, Valerie! Hope your dentist can do something to ease the pain for good… Feel better soon! Thank you Amy you are so kind…… have just bought some pain– killers which I never use! So should start to mend !!! Thank you Amy… I tell myself that time heals all … my problem is frozen muscles and nerves in my cheek after three injections that didn’t stop the pain ! but I’ll get there !!!!! What an alarming experience!!! I am so glad it was the back of the car and not the front of the car…like the window glass with you sitting right behind it! I sent prayer upward for thanks that you were not harmed or disfigured or hurt!!!! Thank you so much Linda – yes I was very lucky that the only damage was to metal and glass, and not body! Perhaps it has saved you from a worse occurrence, one never knows. I always need to find some good reason, even if it doesn’t outweigh the negative consequence. Your deeds all had good intentions 🙂 Onward tomorrow! Ha-ha, Claire – thank you for your cheery comments ! Yes, life is never dull – my life’s lesson – the compulsion and attachment to keeping my word, even when it wasn’t important and was rather inconvenient – learning to put my needs before others !!!!! Are the Keruru eating their frozen mixed veg? I was intrigued to learn that they would eat those things. Let’s hope they survive and if they do it will be, in good part, thanks to your stirling efforts. I hope you are warm and dry as this drenching weather system saturates us all and with bitter cold to come! Good morning friend – thank you for all your comments and commiserations!… things slowly coming right !!! Oh what a storm, isn’t it. We lost our power for twelve hours a couple of nights ago, and with the gales and squalls I won’t be surprised if it happens again – memo, go and fill some saucepans with water ! The main thing is to have lots of dry logs for the fire !!! Though not a perve I must admit the thought of you in your fuzzy slippers and PJ’s chasing goats, well it did bring a smile. Okay, it brought a great smile and some giggles. I am so sorry for your teeth aches, these are the worst. I hope you are feeling better soon. There is nearly nothing worse and it sends misery throughout. I am sending you love in the hope it helps. You know as you talked about all your birds, I had forgotten it is winter where you are. Is the glass bowl working? Hello Val. so glad you had a giggle ! Yes, it really is winter at the moment…real midwinter icy squalls, wind, rain and hail… I don’t feel like going out in it to get my hair cut this afternoon… thank you for your loving thoughts… am now nursing a bruised jaw after three injections, none of which worked! I think the glass bowl will take some getting used to… it always takes the birds a few days… but the wheat for cooing doves and sparrows and chaffinches disappears pronto, as does the fruit on the fence! Lovely to be in touch across the world …. I must look up some of those birds. New names for me. I love to read your descriptions of life how you experience it, Valerie! Many of us seem to have hectic times, these days. My trip to Berlin during the start of this week had its hectic moments, too – as well as its beautiful ones. Yeah, here is to peace and calm!!! All is well, here, although it still seems to get challenging, once in a while. In my experience things usually work out fine when (if, haha!) I manage to center and focus on love and inner peace, first. Might be that works for you as well, to get along with the dentist ordeal. Much love – and I appreciate you, too! Thank you Stephanie for all your comments and good wishes… I’m back to normal now,… I can’t take anti-biotics, pain killers, dental injections or anything else, so three injections from the dentist was a long drawn out ordeal, until they had worked themselves out of the system !!! I’m glad to hear that you are getting back to normal, again. I totally hear you regarding strong medication! – Our high summer is rather feeling like spring and fall, most of the time… Well, that’s fine with me! 😀 – Enjoy your weekend as well, now that all the “poison” has left the system! Sorry about the car! but the post is beautiful, as usual, and I’m “tweeting” it in hopes that others will partake of the fruit that is your writing. Dear Luanne, thank you for your lovely comments, and also for Tweeting – a refinement I haven’t yet learned about !!!! I only recently started tweeting. It’s turned out to be useful for sharing stories and posts and tips for writing submissions with others.